When Audio, at 10 Marine Parade on the Kemp Town seafront, closed earlier this year, it reminded me of my first time clubbing in Brighton. I was sixteen at the time, and Audio was the Escape back then. It was mid-week and there were about ten people there but it was a seminal moment nevertheless. An earlier building on the site was a bow-fronted Regency affair. It was certainly a hotel before it was demolished (Field’s Pier Hotel) but may well have started as a house. The current building, dating from the 1930s consists of a music venue on the ground and first floors. A side entrance on Charles Street leads to Pier Court above – seven flats within three storeys and a rather makeshift penthouse-style level with roof terrace on top. 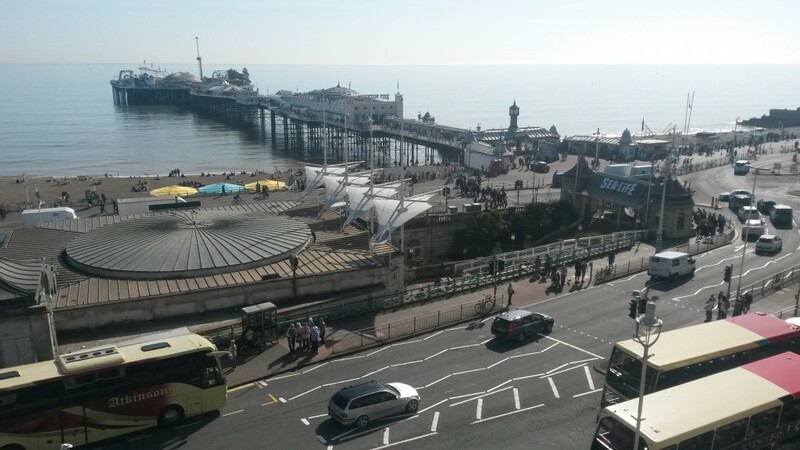 The terrace has quite magical views of the Palace Pier and sea. The venue has had a number of names over the years including the Pier, the Buccaneer and the Royal Escape. It’s interesting to see what is currently being exposed in the ongoing refurbishment of the premises as layer upon layer of old schemes are being stripped away. 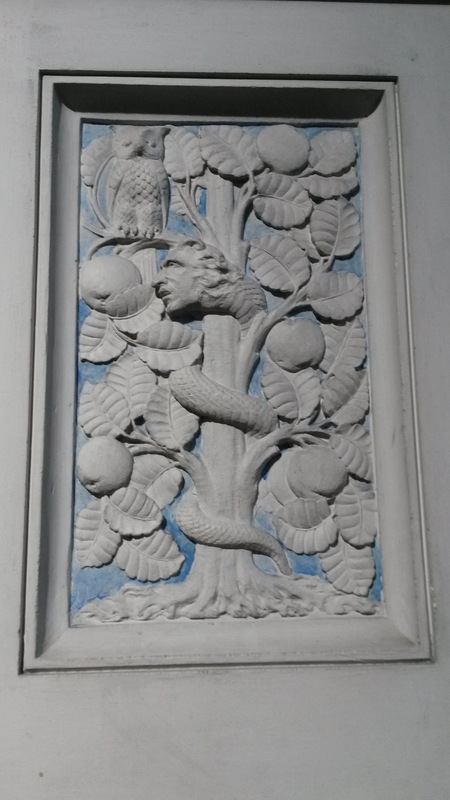 All sorts of wacky tile arrangements have come to light during the works – some dating from the 1930s – of which several will be incorporated into the new venue. The first job of the new owners of the building is to remodel the ground and first floors to a tight deadline. The flats and exterior will be attended to afterwards. I was shown around by Hove-based architect Steve Seary whom I originally met whilst making candy-floss at a fete in Stoneham Park. The building contractors are a new Hove-based company called Detail Building Contractors Ltd. They certainly have their work cut out. The venue will reopen as Patterns on 13th May. 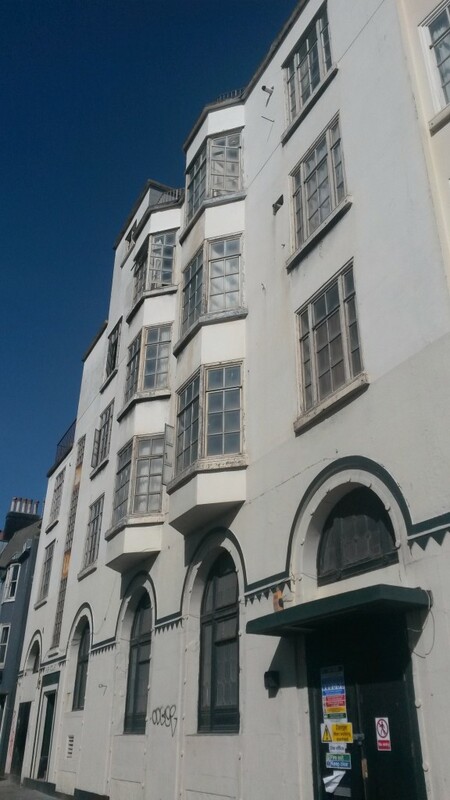 Plans to carefully restore and reveal Puget’s Cottage, one of the oldest buildings in the Lanes, came close to derailment last year when a small group of conservation extremists called for the listing of the Timpson building on North Street – a fairly modern structure in dreadful condition and of little historic interest. When Puget’s Cottage was recently discovered by architect John McLean of Brighton-based Morgan Carn Partnership, tucked away behind Timpson, it was instantly recognised as something special. Having been land-locked for decades, surrounded by other buildings and their successive extensions, it had simply been forgotten. An opportunity now exists to restore this 17th century gem. 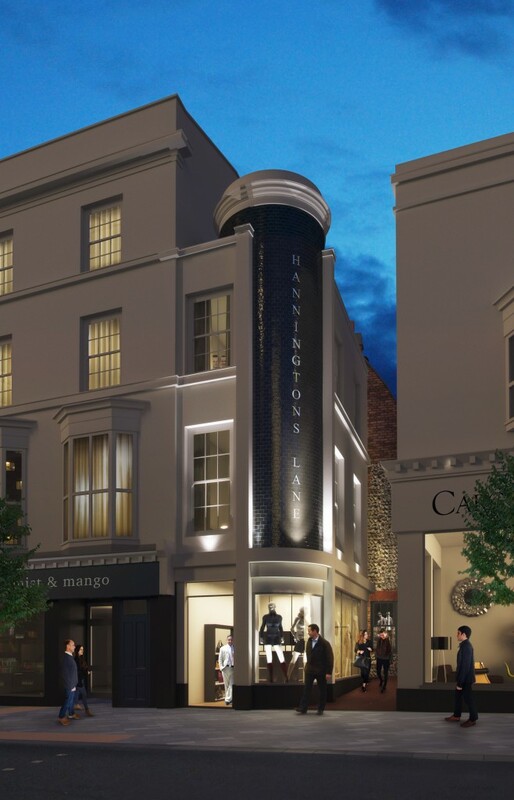 One of Brighton’s most exciting planning proposals, masterminded by a variety of parties including McLean and developer Ed Allison-Wright, includes the complete refurbishment of Brighton Square and the creation of a whole new twitten between Brighton Place and Meeting House Lane with 15 new shops in total. The best bit though, a new link between all of this and North Street, was withdrawn from last year’s planning application (which was passed unanimously incidentally). The reason for the withdrawal was the inclusion of the Timpson building within a last-minute listing application for Puget’s Cottage, called for by the aforementioned conservation extremists. It was deemed that Timpson’s listed status would jeopardise the rest of the scheme’s chance of success. Creating the open-air link to North Street involves the demolition of Timpson which is to be decided within a new planning application shortly. I’d rather see Timpson gone and Puget’s Cottage behind exposed and brought back to life. That is the sensible approach when it comes to conservation. I am happy to add my voice as support for this most sensible of planning applications. Let’s hope that logic prevails when the application is considered on 22nd April. The interior of St Mary’s Church, at the foot of Upper Rock Gardens in Kemp Town, brings together Byzantine, Classical, Gothic and what I interpreted as medieval details. A visit from me to the ‘Cathedral of Kemp Town’ was well overdue. The church’s roof consists of 27 different slopes, I was told by Churchwarden Katherine Prior. The red-brick Grade II* listed building appears large from the outside but even more so within, perhaps because it is set into a steep hill. St Mary’s is the second church on the site. The first, dating from 1827, was a Neo-classical take on the Temple of Nemesis. It fell down in 1876. St Mary’s opened in 1878 to the designs of architect William Emerson. A clock tower was planned but never completed (a similar story to that of All Saints and St Patrick’s in Hove). The baptistry takes influence from ancient Byzantium. High above, the capitals on the top of huge columns are Classical; the vaulting throughout is Gothic. The chandeliers have a medieval feel. The best view is from the organ loft above which looks down onto the altar. The appearance of the church changes throughout the day as the sun graces different stained-glass windows. Two caught my attention. 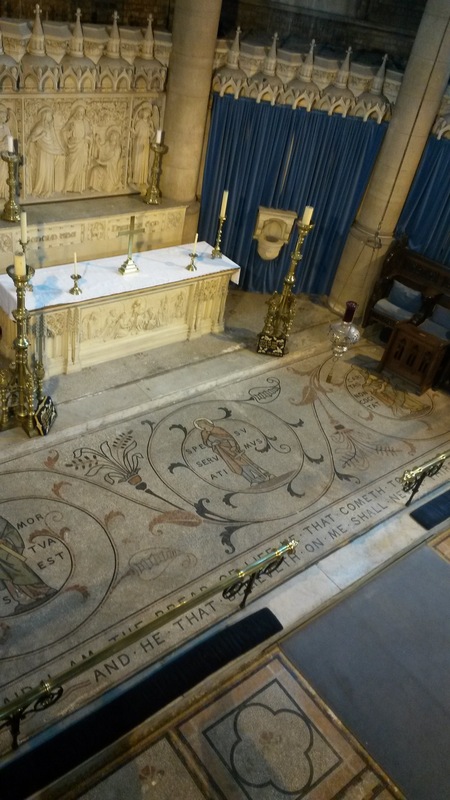 The first, dating from 1906 and showing St John and St Mary before the Crucifixion, is by Charles Eamer Kempe, a famous glass maker and the youngest son of a cousin of Thomas Kemp, the developer of Kemp Town. The second, ‘The Tempest’, used fragments of an earlier window that was destroyed during the Great Storm of 1987. St Mary’s was recently granted Heritage Lottery Funding for investigative work in advance of a large restoration project. A visit during Brighton Fringe or on their open day on 5th July is well worth considering. 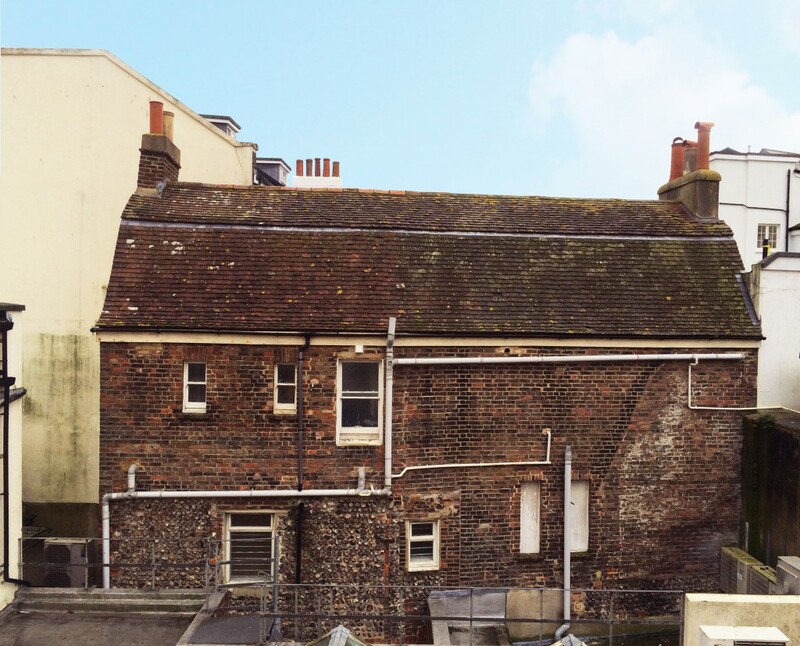 I was recently fascinated to see the substantial ground floor flat at 53 Marine Parade in Kemp Town – a five-storey Regency townhouse with a footprint several times that of its neighbours. The house was built during the 1810s, not long before the Chain Pier was built nearby in 1823. In 1865, it became the home of Captain Henry Hill, a prolific collector of French and English contemporary art who had amassed a collection of over 400 canvasses by the time of his death in 1882. His collection included paintings by Degas, Prinsep, Frank Holl and Frederick Walker. There are just a handful of seafront townhouses in Brighton & Hove that dwarf their already large neighbours. 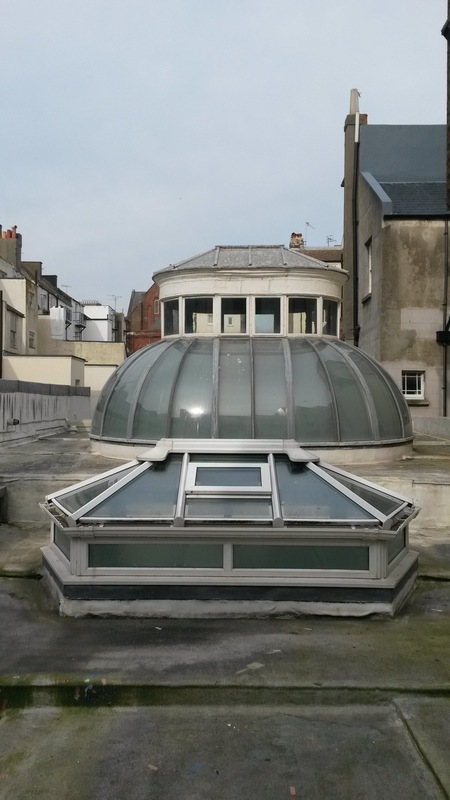 Examples include 58 Marine Parade, just a block away, with its atrium staircase and ballroom, and 26 Brunswick Terrace in Hove with its rooftop synagogue and intimidating rear protrusion. I’m not sure if Hill picked the building for pre-existing top-lit gallery spaces at the rear, or if he had them built. Either way, the four former gallery spaces are mind-blowing; especially the room that is today the master bedroom. As the building is unexpectedly deep, the room’s existence is a surprise. A lounge, kitchen, courtyard, snug, and sky-lit service area must be passed to reach it. 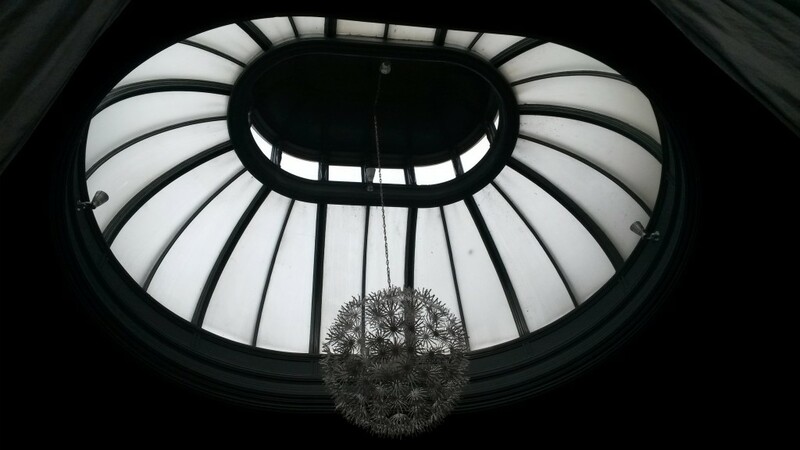 High ceilings and undecorated walls make for quite an atmosphere – and a whopping skylight more than makes up for a lack of windows. At one point, the building served as a nursing home and was later home to squatters who inevitably caused damage. It was presumably converted into flats towards the end of the 20th century. The refurbishment of the ground floor by owner Lucy Goodman was actually covered on Channel 4 by Kirsty Allsop. Lucy has decided to sell and is now marketing the property with Brand Vaughan.